(NaturalNews) Bill Nye, the "Science Guy," is a favorite childhood icon to many people, often touting the wonders of the universe with ease and simple explanation. He's a trusted source, a man with a passion for science, someone who places value in understanding and preserving all of life's intricacies. Sadly, it appears that Bill Nye has gone to the dark side. You see, he paid the folks at Monsanto a visit. As if that's not concerning enough, rather than conveying words of warning about his meeting with the GMO-loving people, he's rather exuberant about his experience. In fact, so thrilled is Nye over the visit, that he feels it warranted a revision in his book, Undeniable: Evolution and the Science of Creation. 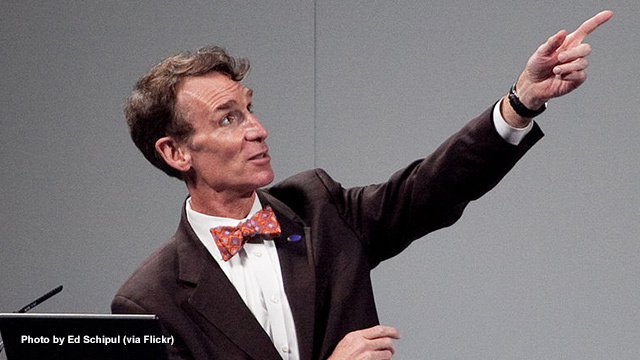 Why, oh why, Bill Nye? His excitement in this regard can't be mistaken; clearly, whatever he's revised about GMOs in his book isn't one that matches health-conscious people's stance on the evils of Monsanto and GMOs. This situation is also concerning because an earlier video, also found on YouTube, shows a very different Nye. Who would think that in the future, he'd be standing alongside Monsanto -- literally and figuratively? It will be interesting to read Nye's book updates, but it's feared that Nye's visit with Monsanto scientists has changed him, and not for the better.